As inventions go, it pales in importance to, say, the polio vaccine or alternating electric current. Nor is it as fun as the Ferris Wheel, movie theater, baseball stadium, or broadcast radio–all of which Pittsburgh likes to take credit for…if not inventing, at least getting there first. When it comes to food, we’ll argue the innovation of French fries injected into salads and sandwiches is an altogether superior achievement and Pittsburgh’s many weirdo regional pizza varieties are unique and different enough to warrant their own series on these electronic pages. Despite all these other advancements to society, it is McDonald’s flagship double-decker hamburger alone that gets a dedicated visitor center. 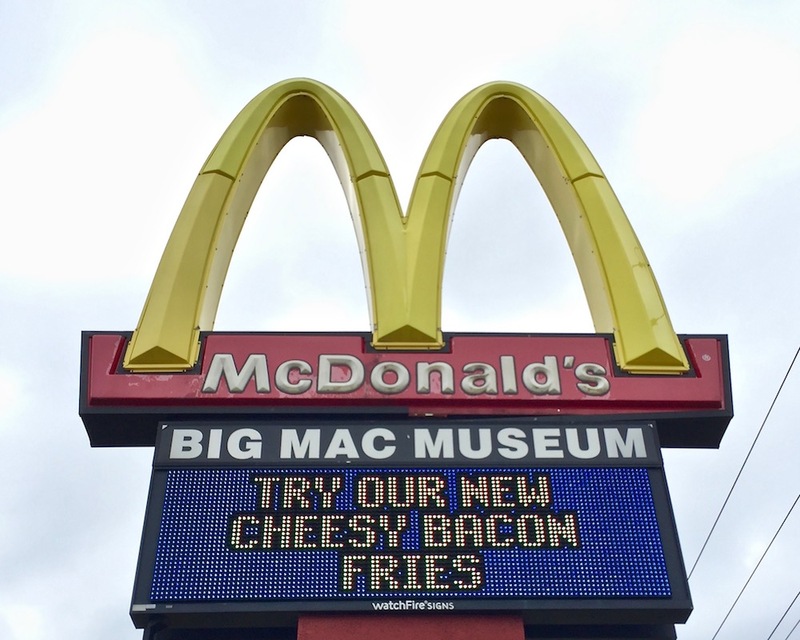 That’s what brought us to The Big Mac Museum. Truth is, the Big Mac wasn’t actually created here. At least not right here in the city–where it appears on numerous famous things from Pittsburgh lists–nor here in the exurb of North Huntingdon, Westmoreland County, where its eponymous museum was constructed along Route 30. 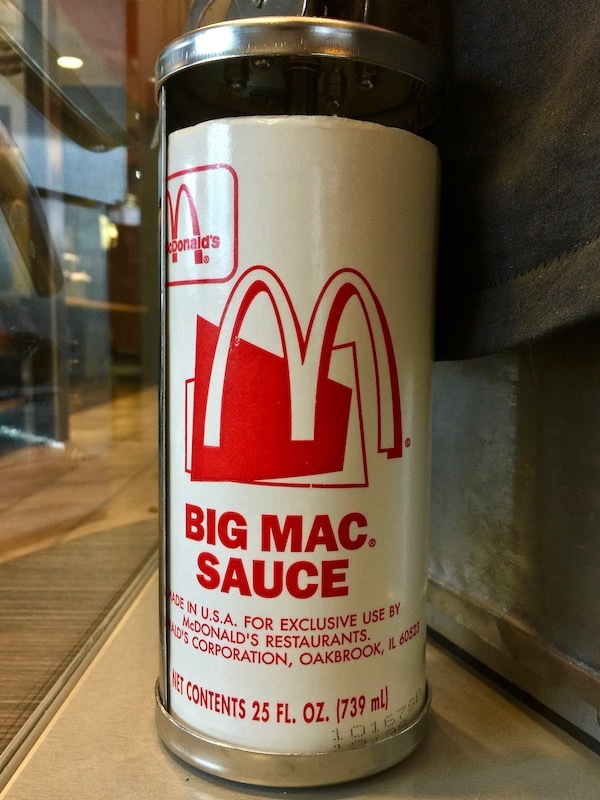 No, the Big Mac’s two paddies, three buns, pickles, cheese, and yes, “special sauce” were first concocted in a North Hills McDonald’s and served to the public some 50 miles south in the small Fayette County city of Uniontown. It was there, in 1967, that early franchise owner Jim Delligatti went rogue. In an act of corporate insurrection that would likely get an operator slapped with a brand-violation lawsuit in today’s world, Delligatti took the same basic ingredients–plus a special double-cut bun–and made a bigger hamburger. 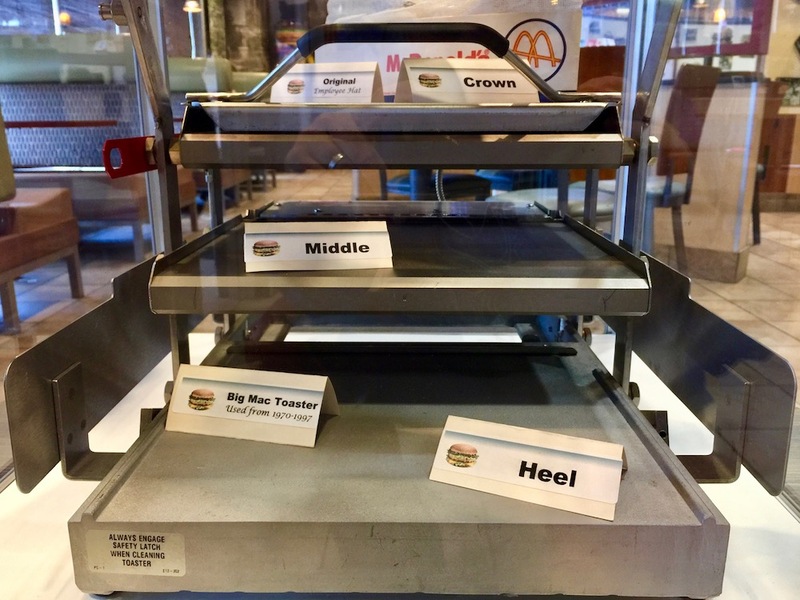 With that one action, the restauranteur simultaneously created a local sensation, invented super-sizing, and put him on anyone’s short list for induction to the McHall of McFame. By the next year, the informative display at the museum tells us, the Big Mac had been introduced nationally with a TV commercial called “Big Attraction.” In that minute-long spot a host guides the viewer through the elaborate layering of the sandwich. The escalating excitement in the narrator’s voice is truly infectious: we start as passive participants in an emotionless guided tour but are soon sucked-in by the surprise elements of a “club slice,” “another hamburger!” and “a little more sauce, just for good measure.” It’s also worth noting the flavor-enhancer here is referred to as “our own secret sauce.” That sauce would become “special” by some point in the early 1970s. 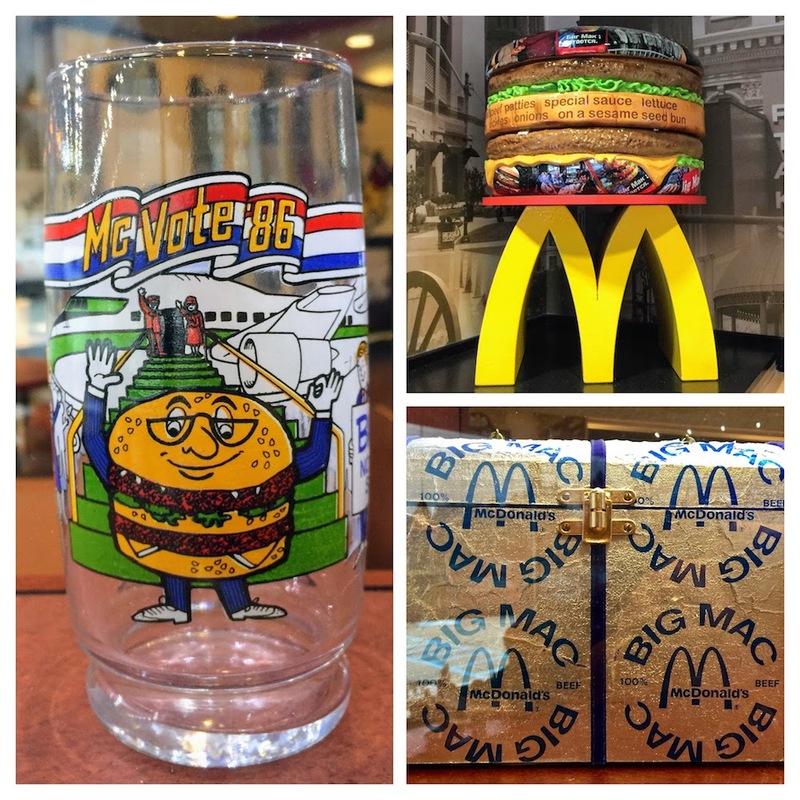 The Big Mac Museum was opened in 2007 to honor Delligatti’s 50th anniversary as a McDonald’s franchisee and visitors should know that it’s housed in the dining room of a working McDonald’s restaurant–so there may be some challenges getting around to all of the display items at peak dining hours. In fact, in order to bring our readers the full experience, Orbit photographers had to wait out some chit-chatting customers who were finishing breakfast. 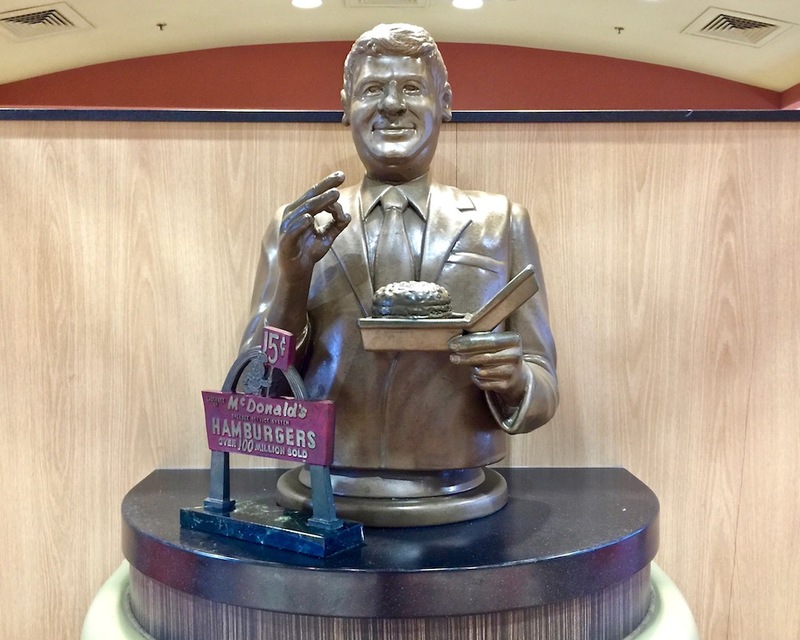 The couple was installed at the obvious power-broker table, right in the middle of the restaurant with its custom rounded upholstered seats, sitting under the bronze statue of Delligatti–one hand making the OK gesture, the other holding a Big Mac (photo at top). 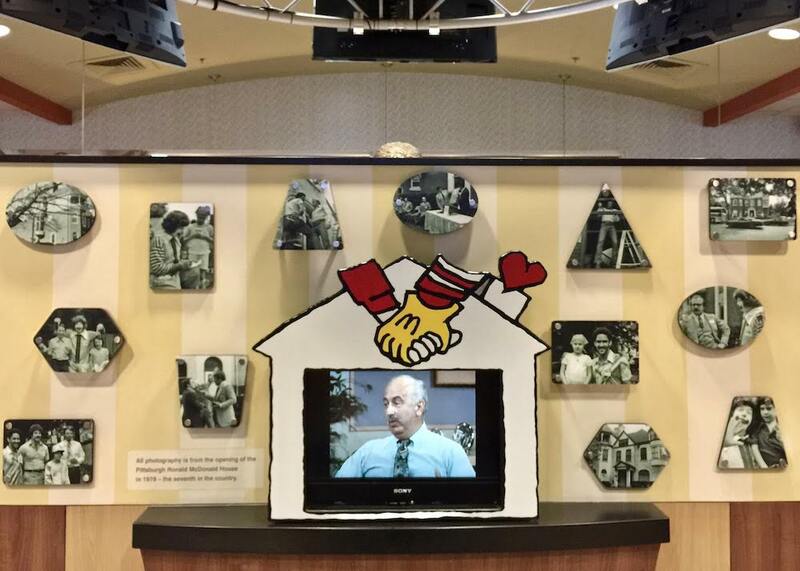 While it’s not The Carnegie or Heinz History Center, The Big Mac Museum offers a lot to see–and, you know, the price is right. There is a bank of historical photos with a timeline of pivotal events in the life of the sandwich, a video installation featuring an interview with Delligatti, photos and a Delligatti family tree, equipment used in the restaurant, an array of packaging through the years, and plenty of novelty items. Rock the McVote ’86! 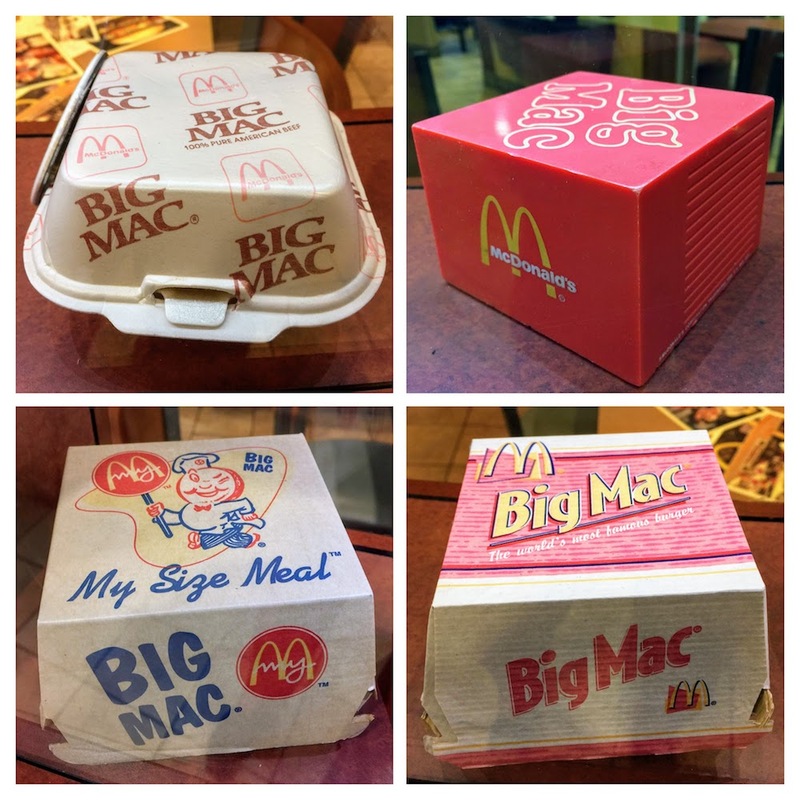 Various items from the Big Mac Museum. The Rt. 30 McDonald’s is one of those jumbo versions with an indoor play area for the tykes. This is also where you’ll find the world’s largest Big Mac. The 14-foot sculpture of the signature burger on a decorative stand reads as both over-the-top pop art and weirdly hyper-realistic. It’s also so big that it would look great as a legit out-in-the-elements roadside attraction. For now, though, visitors will need to park the car and come inside to see it. This is one BIG Mac. “World’s largest Big Mac” sculpture. On the one hand, The Big Mac Museum is just classic goofy roadside America–not that far off from World’s Largest Ball of Twine and the like. [In fact, Roadside America (the web site) already beat us to the museum.] Despite me not really giving a hoot about McDonald’s, I found the story of Jim Delligatti, his family’s fast-food empire, and a time when one franchisee could influence change at the corporate level to be really interesting. 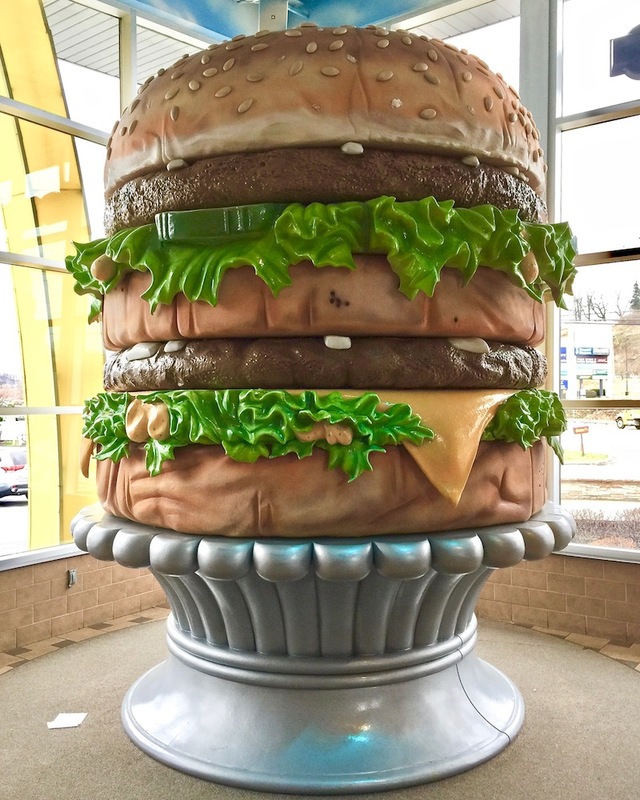 On the other, though, there is a lot that could be said about American values when we immortalize a factory-farmed, mass-produced, unhealthy-in-every-way double hamburger–literally putting its tribute on a pedestal–displayed in a soulless highway strip. This, while a lot of Pittsburgh will never forgive Mayor Peduto for adding bicycle lanes. Sigh. ‘Tis the season. 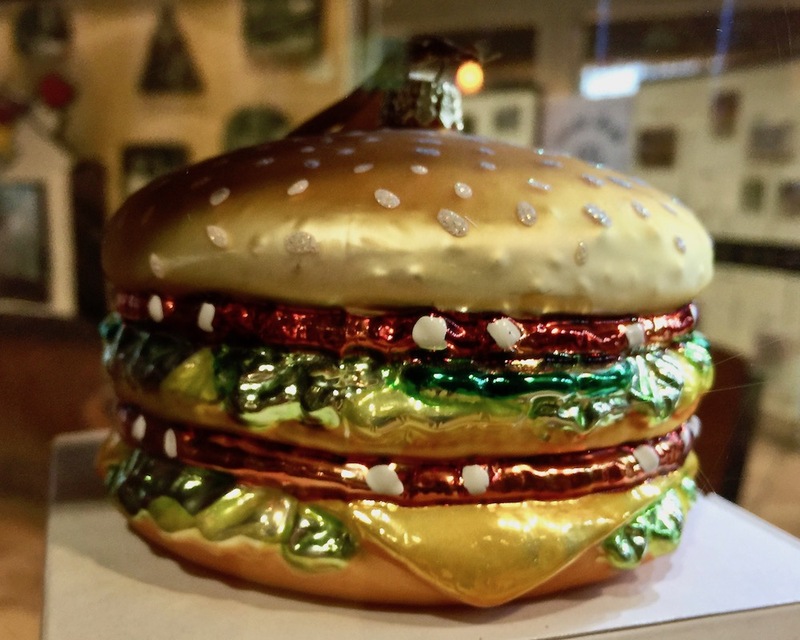 Big Mac Christmas ornament. The inevitable question: is it worth the trip? If you’re already out east, along Rt. 30, and you’ve got an extra 20 minutes, by all means. Also, if you just love either local (recent) history, McDonald’s, or roadside kitsch, yes–you’ll not be disappointed. For everyone else, maybe we could put the ol’ hive noggin together and dream up an alternative, grass roots and for-the-people yin to the Big Mac Museum’s yang–say, The French Fry Museum, Pierogi Palace, or–be still, my heart–The Western Pennsylvania Pizza Hall of Fame. We’ve got a few nominees for the inaugural class. Getting there: The Big Mac Museum is on Rt. 30 in North Huntingdon, very close to the PA-Turnpike exit. Look for the big McDonald’s sign and you can’t miss it. Admission is free and the museum is open whenever the restaurant is.